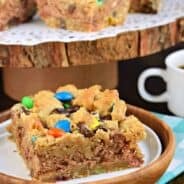 Looking for a quick and easy dessert idea? 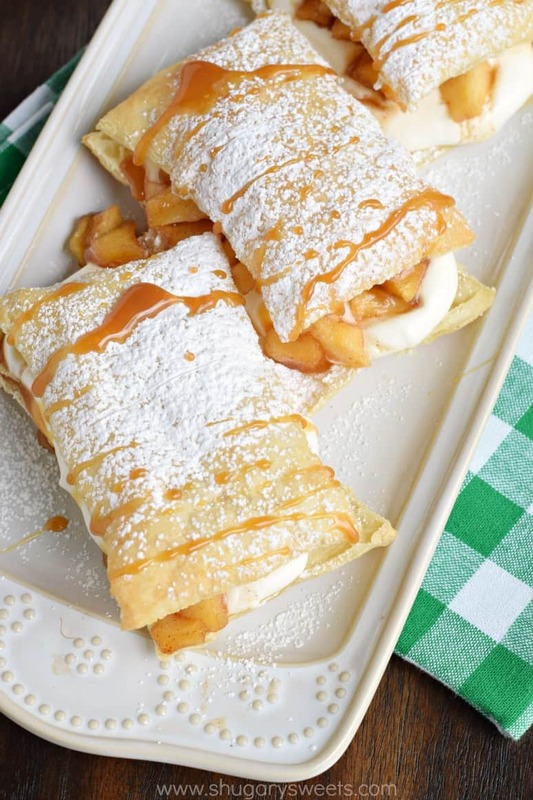 These Caramel Apple Cheesecake Napoleons are a mouthwatering dessert made in no time! Be sure to sign up for my free email subscription...new recipes in your inbox! With summer fast approaching, I’m always on the hunt for easy dessert ideas. While ice cream and popsicles are always a good option, sometimes I just crave comfort food. Even on a 90 degree summer evening! But, who wants to slave over baking a pie, and rolling out a pie crust? Not me. I use frozen puff pastry that I thaw on my counter. If you prefer to make your own, more power to you. But, honestly, after mowing the lawn, sitting at the pool, and running errands, I ain’t got time for homemade. 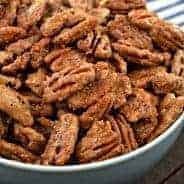 Another fast and easy ingredient I use is Crunch Pak apples. 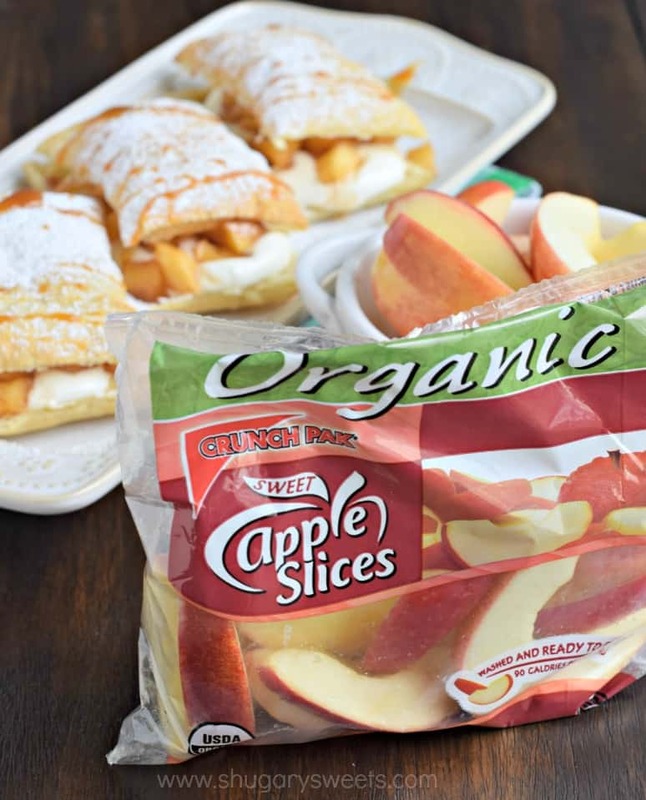 These sliced up apples are my answer to dessert. I love making a big plate of Apple Nachos. Best thing ever. In today’s recipe, I bought the bigger bag of Crunch Pak apples and peeled and diced them quickly. While the puff pastry was thawing and baking, I whipped up the caramel apple mixture on the stove top in under ten minutes. I refrigerated this until I was ready to assemble my dessert. I also make the cream cheese filling and refrigerated that as well. Once the puff pastry was done baking and cooling, you can store in an airtight container until dessert time. This is a great recipe to make all the essentials in the morning. Then come dessert time, just assemble and enjoy! And you will enjoy these! I guarantee! Okay. Well, it’s not like I’ll give you your money back or anything…but I pinky swear that these taste amazing! While we’re out at the pool, I’ll be snacking on some bags of Crunch Pak Apple slices. The organic variety that I find at my local Costco is my favorite. The snack bags are a little larger, which is perfect for my hungry teens! Thaw puff pastry on counter according to package directions (takes about 30-40 minutes). Unfold pastry and cut along the two seems (into 3 rectangles). Then cut horizontally, creating 6 pieces. Place on a parchment paper lined baking sheet and bake in a 400 degree F oven for 13-15 minutes until lightly browned. Remove from oven and cool completely. Once cooled, slice in half lengthwise through the center. Set aside or store in airtight container until ready to assemble. For the filling, beat cream cheese, sugar and cream together for 5 minutes, scraping down the sides of the bowl as necessary. Set aside, or refrigerate until ready to assemble. While thawing the puff pastry, peel and dice the Crunch Pak sliced apples until you have 4 cups. Place in a large saucepan with brown sugar, cinnamon and lemon juice. While stirring, bring mixture to a boil over medium high heat. Reduce to medium and cook for 5-8 minutes, until apples are fork tender. Remove from heat and cool. 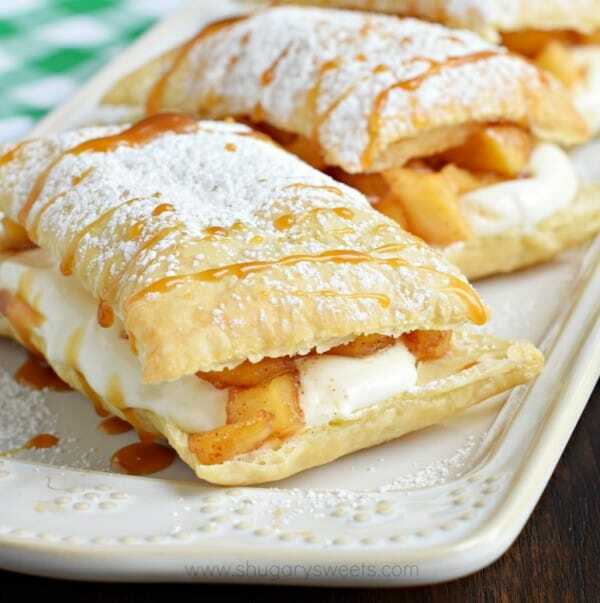 Once cooled, assemble napoleons or refrigerate apple mixture until ready to assemble. 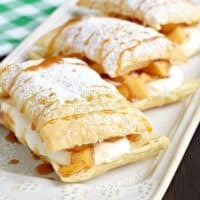 To assemble: open all the puff pastries and evenly divide the cream cheese mixture on the bottom "bun". Top with caramel apple mixture. Place puff pastry tops on and sprinkle generously with powdered sugar. For added caramel flavor, drizzle with your favorite caramel sauce! Serve immediately after assembling! 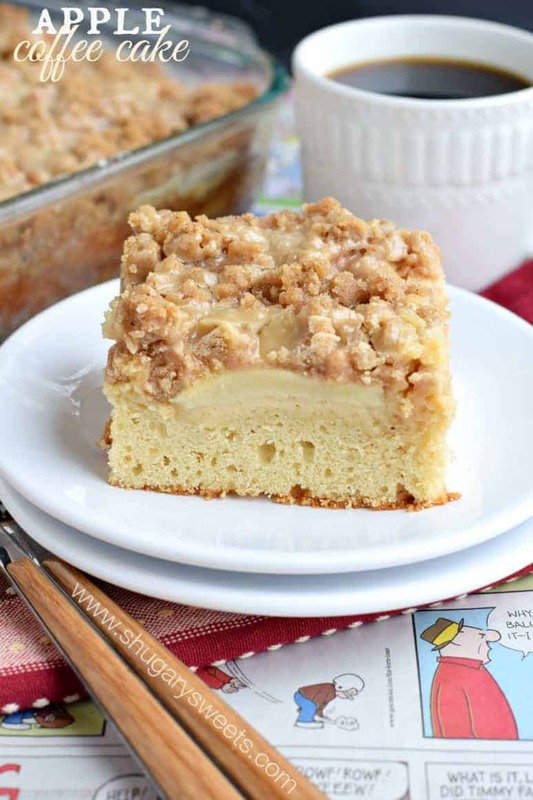 For more delicious Apple Desserts look no further…..
Apple Coffee cake: moist coffee cake topped with sliced Crunch Pak apples and a caramel streusel! 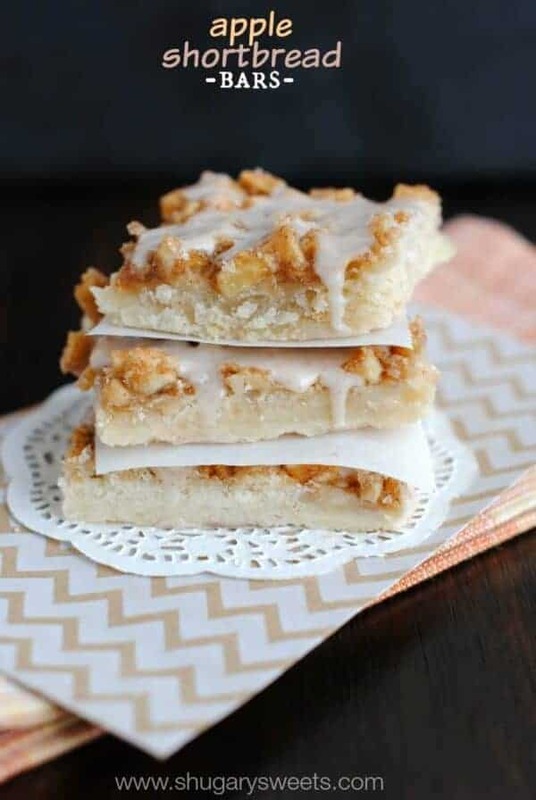 Apple Shortbread Bars: these have been listed as one of my top desserts to ever come out of my kitchen. You must try them! 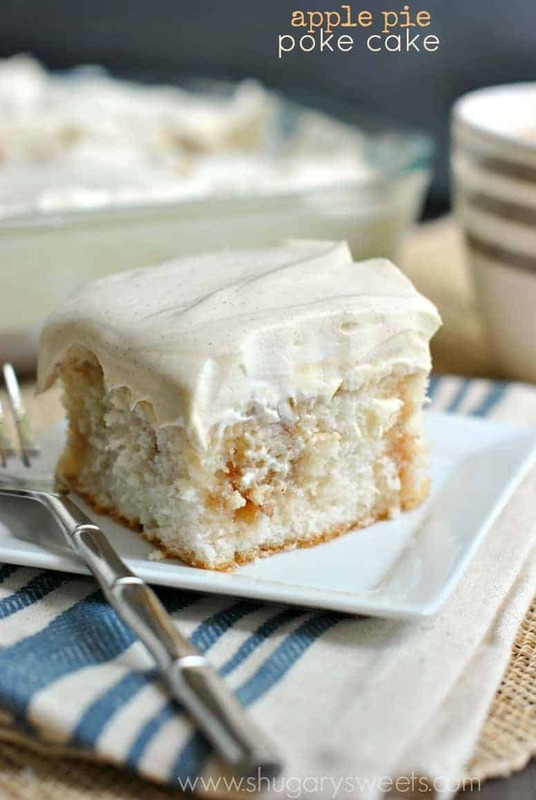 Apple Pie Poke cake: all the comfort of an apple pie in a refreshing, light, summer dessert! I love these Napoleons! I buy crunch pak all the time for snacks to take to work. I never thought about actually using them in a recipe. It’s time I start doing that! These are so pretty! I just used puff pastry at the end of last year for the FIRST TIME. can you believe it? Glad you finally started though 🙂 Better late than never! I know what I’m buying at my next trip to Costco! Love these napoleons Aimee, definitely beats make a big ole pie! These look amazing! I love how easy they are to put together. I also like how the apples are already sliced, I will have to get some to use in my baking. These are seriously beautiful Aimee! Art on a plate! My family would be so impressed, I’m going to try these! 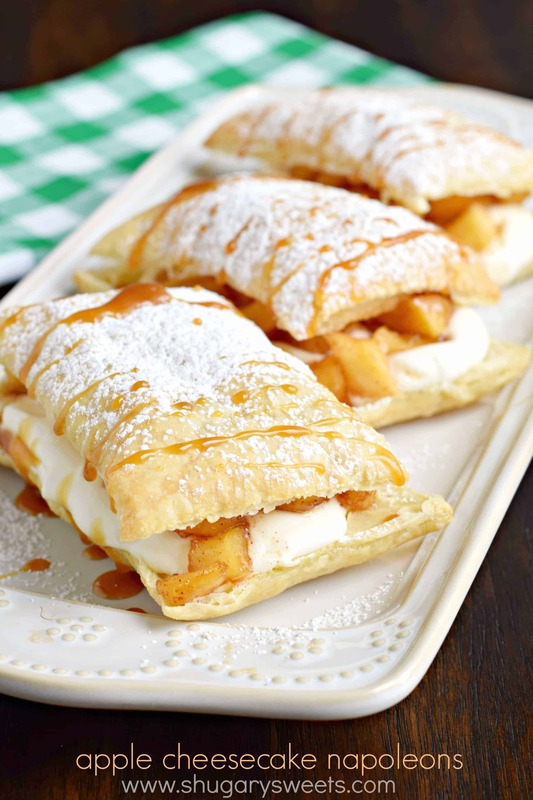 Love the idea of using puff pastry instead of pie crust. It would be the perfect accompaniment for my next coffee get-together or special occasion brunch. I’m confused on how you cut and assemble the puff pastry. Do you cut the 3 rectangles in half to get 6 pieces and then cut those again once baked? When I read your instructions I get 9 servings. Why can’t I get this? When you unfold the puff pastry you will have two seams. cut along those seams. This will create 3 big rectangles. Cut each one in half. This creates six napoleons. Bake. Once done, you’re going to slice these open (like a bun). 🙂 ENJOY!! What kind of puff pastry brand are you using? I bought Pepperidge Farm Puff Pastry and it left a bad taste in my mouth, like old fat. Maybe other Puff Pastry Brands use butter instead? Thanks. These Napoleons are so mouthwatering. I can’t get enough of that cream cheese. And of course, the apples are perfect. 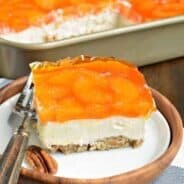 This is a lovely dessert for a warm weather. It’s tasty and flavorful! Why cant I log on to your site?